I just learned that there was also a (much shorter) Simons' BASIC example for the Commodore 64. I ported this for CBR-BASIC (details will follow soon), as shown in the screenshots. Well here is colorized version posted some time ago. 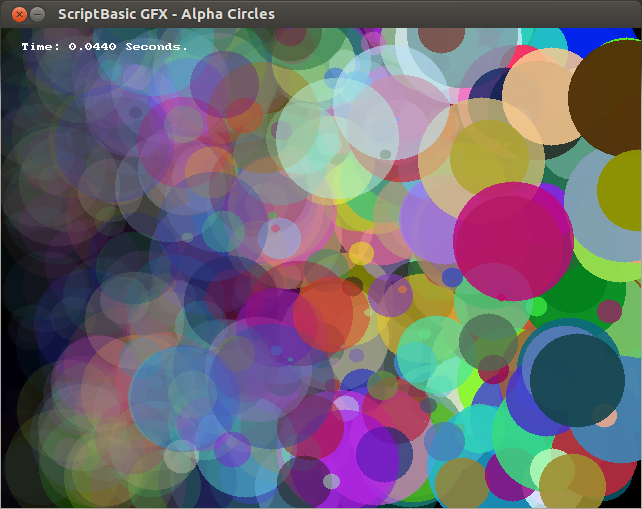 This is my SDL_gfx circle demo. Really not random at all! The circle(s) size, position, color and alpha channel are randomized. Not your code, the original code from which Cyb sourced, the Connett Circles. They are not really random. A random number generator (RND) is never used except to setup different screen shot. BaCon pixel version where I have tried to stick to the original code as much as possible. Thanks Tomaaz, I've yet to figure out graphics on Python, PyGame is disaster! Anyway, although I like red allot, the SmallBASIC code from which you are coloring with d numbers was using RGBF scales not RGB. Tomaaz code defaults to red in the else section, I have no idea how Peter is getting red in his snapshots. It's based on Tkinter and very easy to use. Works with Python2, 3 and PyPy (JIT compiler for Python). I've been using it only with Python 2 as it is aviable in Ubuntu's reposirories. It's a bit outdated but still works and can be used for learning. This is a Python version of Processing (that is based on Java). It comes with a dedicated IDE (the same Processing comes - you just need to add Python mode to it). A Python implementation of classic Logo language. It's based on Tkinter. Extremely easy to use. Sorry about a little bit of off-topic. Oh for Windows and graphics, don't start IDLE from Start Menu! Hmm... that may explain some of my problems. Hehe, may I boast a little? and the attached image shows how the listing would look in the console (i.e. if the #AppType Console mode is active) when run from its original .FBS file (Windows) and a precompiled .EXE (Ubuntu and Mac OS X Wine) if the .EXE isn't exepacked, or password-protected, or both. If it is then the listing won't be seen at all but the code will still run. The .EXE that's attached in the zip below is neither exe-packed nor protected, so its console output will be similar to Wine. The differences are due to the .EXE listing being actually decompiled on the fly from the .EXE itself where its formatting and indentation are minimized and all the PP macros, if any, are already resolved to literals. In the default #AppType GUI mode the listing is of course unavailable. As it happens, a 800x600 pxs window is a bit too much for FBSL BASIC's interpreted PSet() so my window is smaller but responsive and fast, albeit still a little CPU intensive. As I said, I'm developing my Canvas based on your examples, so if I ever need to fill its entire surface with triply nested PSet() loops again, I will have to add a BASIC-to-C translator to the CCanvas class to go fully DynC JIT compiled. I will have to add a BASIC-to-C translator to the CCanvas class to go fully DynC JIT compiled. Nice job adding the text feature to your CCanvas class.